As TramTrain expands in Germany, it is time that the mode is considered for Metro Vancouver and Vancouver Island. Why is LRT so popular with transit planners and operators? It is the inherent flexibility of the system and TramTrain has now enabled simple streetcar routes to expand affordably far into the countryside by being able to operate on existing railway lines. By providing a seamless (no transfer) journey has made TramTrain extremely user friendly and user-friendliness is the prime reason people take transit. FIVE German transport authorities have signed an agreement to jointly procure up to 240 tram-trains with the aim of achieving significant savings in resources, lead times and costs. The agreement was signed in Karlsruhe on March 11 by representatives of Albtal Transport Company (AVG), Karlsruhe Transport Authority (VBK), Saarbahn, Erms-Neckar-Bahn, and Central Saxony Transport Authority (VMS). 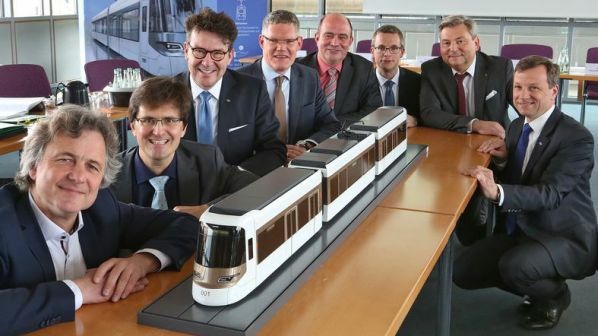 The partners have been working together since July 2017 through the VDV TramTrain project, which aims to ensure the future viability of the Karlsruhe model for tram-train systems and potentially open it up to new operators. This has led to the development of a standard vehicle concept, which is expected to reduce procurement costs by around €1m per vehicle. “This lower unit price results from the fact that one-time costs for the development and authorisation of the standard vehicle can be distributed across a significantly higher number of vehicles,” says project manager Mr Thorsten Erlenkötter. “Variants for the respective transport companies can be derived from the base vehicle. For example, the entry level for barrier-free access varies between the operators’ systems. VBK and AVG have a requirement for around 150 vehicles and will therefore jointly manage the procurement on behalf of all project partners. The first vehicles are expected to enter service in 2025. Final order quantities will depend on the outcome of negotiations for new transport contracts. Saarbahn says it is looking to replace its fleet of 28 Bombardier Flexity Link tram-trains with the new design. AVG says the project partners expect to benefit from standardization by issuing joint maintenance orders and ordering large quantities of spare parts to bring down the unit cost of components. Ontario has a province wide program for the procurement of buses for Ontario transit agencies. It’s the buying in bulk theory, everyone who wants and needs buses for a particular time period simply piggyback on the order. Therefore the per bus cost drops. The main issue in the past is when there is a technical problem with one design occurs, quite a few or all the transit agencies that ordered that particular model of bus now have the same problem. To guard against this, orders from 2 or even 3 manufacturers of buses are chosen. It does raise the cost slightly by splitting the order amongst more than one company it avoids what happened in Quebec last week with its Novabus Hybrid buses. A steering system fault was discovered by Novabus in its Hybrid Bus design sold to most Quebec based transit agencies. All Quebec transit agencies are all encouraged/forced to buy Novabus products by the Provincial Government because it is a Quebec based company. This meant 300-400 buses in Montreal, 100-150 buses in Quebec City, 55 Buses in Gatineau, another 100+ buses in the suburban municipalities in Greater Montreal were also afflicted with this technical problem and forced to park the affected units for a few days. When the order to park even more buses was given even for several non Hybrid Novabus models the next day, the reality was that 20%-25% of the entire province’s buses had to be out of service for a period of 2-3 days. All were Monday to Friday work days. Ouch, that hurts! Wow, an order for 240 rail vehicle units, all the same basic model. In the geographic heart of Europe’s transit vehicle industry. Let the games begin! I think the Tram-Train concept is about to become really popular for every major European LRV supplier. The companies that have off the shelf Tram-Train designs will have a bid advantage. Don’t count out Bombardier, but this is a big opportunity for Siemens, Alstom, Stadler, Kawasaki-Italy, CAF and Skoda because all of these companies including Bombardier, have off the shelf Tram-Train vehicle designs ready to go. This is one of the big problems of Skytrain, there aren’t 7 compatible designs sitting on the shelf waiting to go. In fact, there are also not another 6 or 7 companies right now, scrambling to design a compatible vehicle or Tram-Train compatible technology, so they can get a piece of this contract. 240 Tram-Trains is a once in a decade kind of order! Due to the successful Karlsruhe concept as well as the Chemitz concept (the Tram-Train concept applied in a different way, outside-in instead of inside-out like Karlsruhe), its flexibility (once, scheduling issues are worked out), it’s practically as well as the sheer number of possible systems that this can apply too, due to Tram-Train’s its abilty to be used by smaller urban populations centres means that, its a growth industry opportunity for rail vehicle suppliers. Where Skytrain’s technology is a tiny niche market at best. Oops, that should read there are also another 6 or 7 companies right now, scrambling to design a compatible Tram-Train vehicle or Tram Train compatible technology, so they can get a piece of this contract.